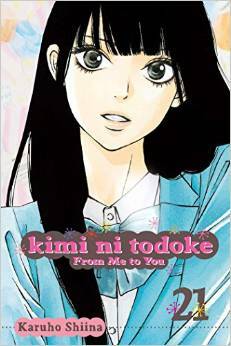 Kimi ni Todoke follows the lives of high school students who are in love. Volume 21 marks real growth and development in the lead characters as they are faced with life decisions for the first time in their school careers. Life is no longer about walks in the park or hanging out after school. Sawako along with her group of friends and rivals are faced with preparing for University entrance exams and career pursuits. Sawako has really grown up from the timid “Sadako” we met in Volume 1. This volume starts with senior year high school students discussing their future plans. Sawako and Kazehaya hope to always live in their small town and decide to go to a local college so they can stay close to each other. We also witness the development of Sawako’s classmates as they begin to think about college, cram school, and the future. It would be silly of me to forget to mention that all of this is happening during birthdays and Valentine’s Day. Sawako’s struggle is not unfamiliar to high school girls. She wants to stay in town because of a boy, which is not uncommon at her age. Older readers will appreciate this decision from a wider perspective since we are armed with the knowledge that not all high school relationships last forever. It is nice to see the childhood innocence of Sawako and her peers as they decide between love and college. Of course, reality kicks in when each student receives individualized counseling in regards to which school is right for them. Sawako admits that she wants to be a teacher while Kazehaya decides he wants to be wherever Sawako is. Sawako’s small town plans hit a roadblock when it is her turn to meet for college advisement. She is told to go to a top-notch education college in Sapporo while Kazehaya has to convince his father he is college material. Witness their confusion and frustration in this gripping volume. I definitely liked Volume 21 of Kimi ni Todoke. Despite the heavy theme of choosing a college and picking a career, it was filled with fun moments and issues most readers can relate with. This volume shows the maturity of Sawako and how she has managed to make friends even as a loner. It also shows that high school is not only about getting good grades and pleasing parents. These students are faced with serious decisions that will follow them throughout the rest of their lives. Readers can really feel the impact of the characters’ choices. Most high school comedies are typical slice-of-life without the drama of life outside of school. This volume really shows the difficulties high school students face when they’re not trying to have fun. Between Sawako’s confession to Kazehaya, Valentine’s Day chocolates, and family drama, you realize life was damn hard as a high schooler. If you are following this series, I promise you will not be disappointed with the course of the story in this forthcoming volume. Kimi ni Todoke continues to catch my attention even though I am far too old to be reading about the problems of teenagers. **This product was provided for review.